Scone is a single serving quick bread or a cake, they are prepared with flour or oatmeal with baking powder, lightly sweetened and glazed occasionally. Usually scone was round and flat but today scones exists also in triangle shaped. When sold commercially scones will be usually round, but when prepared at home, they may take various shapes like rounds, squares and triangles. Baking scones at home is very easy to make and you can make them either as sweet ones or savoury ones just by adding any ingredient of your choice. Personally i love to add chocolate chips, raisins or simply nuts in sweet scones. While savory scones can be prepared with cheese, onions or with varieties of chopped herbs. Griddle scone or girdle scone is a variety of scone prepared in a griddle which is fried in a small amount of butter or in a frying pan than baking. This way of making scones is very common in New Zealand, where scones of all varieties forms an important part of the traditional cuisine. 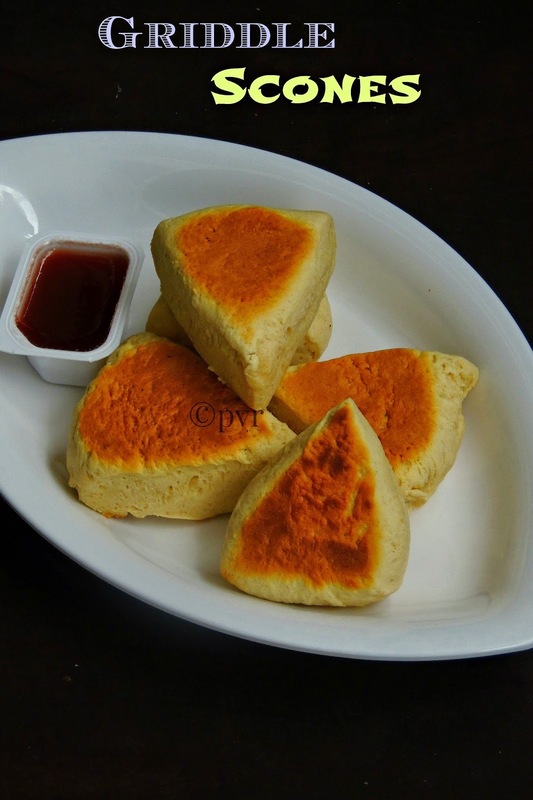 In New Zealand,this griddle scones are cooked in large disk which is divided into wedges for serving. Griddle scones are served often with jam,butter or simply with honey for breakfast.These griddle scones will have a super golden crust with a tender interior. Am running my first week of blogging marathon and theme of this week is Do E-N from the List of Breakfast Foods, i picked this griddle scones from the list and enjoyed thoroughly for our sunday brunch.Check out the Blogging Marathon page for the other Blogging Marathoners doing BM#41. Sieve together the flour,baking soda and salt in a bowl. Add in the buttermilk,melted butter and mix everything, knead slowly to form a soft dough. Pull out the dough in a lightly floured surface, divide into half, knead each half for three to four times. Roll or pat each hald into 6inch round disc, cut each as 4 wedges. Heat a griddle or a pan in low heat until hot, cook the scones over low heat, increase the heat slowly and cook until the scones are puffed. Cook on both sides until the crust turns golden brown. Adjust the heat and cook slowly, take care not to burn the crust. Transfer to a rack, let it cool for a while. Enjoy with jam,butter or simply honey. Sounds interesting and looks good..and good information too. 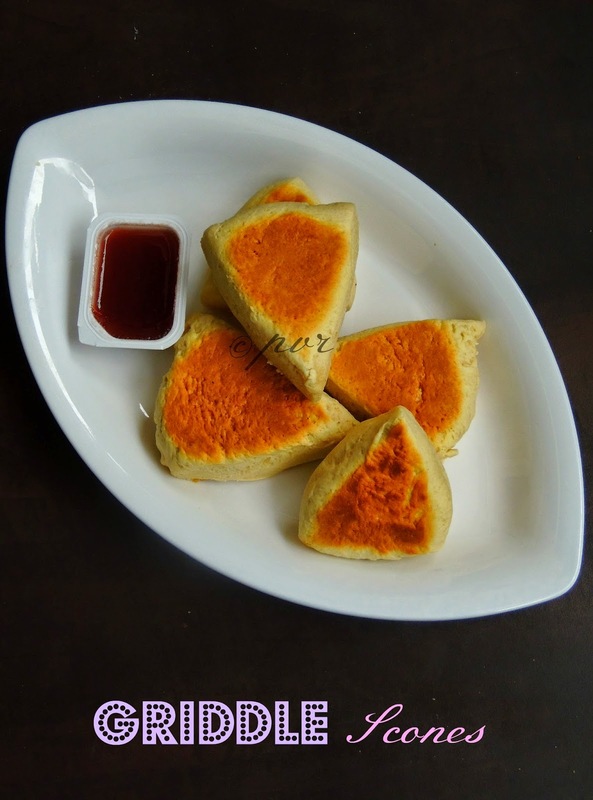 yumm.. very interesting and easy to make..
Priya, your girdle scones came out perfect. Even I made these scones. I am doing this theme in the last week though. my niece made some lovely scones once, never tried making them myself. Semma soft ! Bookmarked ! wow that is so simple and so delicious!!! pictures are tooo tempting Priya!! Wonderful looking scones. Must have tasted awesome. They look lovely, very few ingredients and done in a pan, am going to surely try this, might be the savory version..
Nice scones for the tea time. Perfect for a nice evening snack. Nice recipe.. will try it out. Your girdle scones have turned out great! Sounds too good Priya. No baking. On griddle sounds perfect! Griddle scones looks beautiful ! Love scones especially savory ones. Yours have browned so well. They look so good. They look amazing and btw how did they taste? Those griddle scones look yumm!! Totally new to me. another new recipe to me.. bookmarking this... ! is that jam you have applied on top Priya ?